From I65 south take exit 256 B (from north, take exit 256A). Go south 1.7 miles and take a right on Citation Court. The branch is approximately .3 miles on the right. From Lakeshore Parkway take Oxmoor Rd north .5 miles and take a left on Citation Court. The branch is approximately .3 miles on the right. Citation Court is across from the Homewood High School football stadium. The Birmingham location serves central Alabama including the cities of Tuscaloosa, Huntsville, Montgomery, Anniston, and Auburn. Continental Carbonic Products, Inc. in Birmingham, AL is one of 46 locations in the U.S. and Canada where you can buy dry ice in both cut block and pellet form. 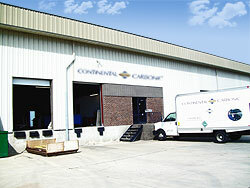 Continental Carbonic offers the highest quality, food grade dry ice in the industry.